I’m a die-hard map geek. It all started many moons ago when I was 4 years old. My father gifted me an enormous, heavy world atlas. It was a giant musty book almost 3 feet tall and an inch thick. Unsurprisingly, my father was a high school geography teacher. I turned the sacred pages carefully, amazed at the detail and breadth of our world. Carefully inspecting the network of roads that connected cities in Latvia. Studying the topographic contours of Brazil. I would daydream about what life would be like in far-flung countries I could barely pronounce. A travel dream was born. Little did I know that those map reading skills would prove invaluable in my adult life as a professional travel writer and photographer. Navigating busy cities is a breeze. Hopping across continents is no sweat. I still love maps today. So, it was no surprise when I found myself getting a little giddy upon discovering the latest mapping trend that helps keep track of your travels. Recording your journeys is as old as time. Prehistoric Paleolithic dudes did it. Ancient Greek conquerors did it. Venetian merchants did it. And now we’ve evolved to tracking our travel with high-tech gizmos and satellites in the sky. But there’s something satisfying about tactile sensations that smartphones just can’t replicate. The scratch off world map. It’s blissfully simple. You don’t need any complex instructions - anyone can do it. And you get the same buzz as an instant-win scratchy game, but there’s no gambling involved… everyone’s a winner! 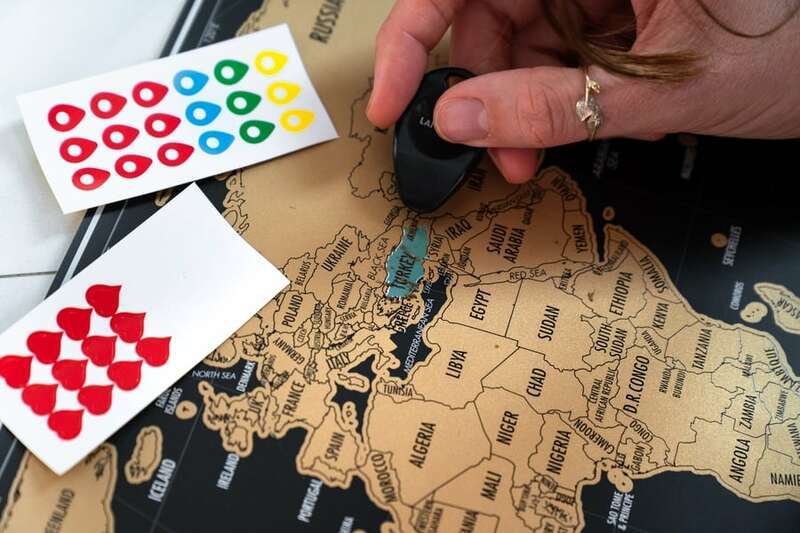 Simply scratch off the foil from countries you’ve been to, and you’re rewarded with a gratifying burst of colour and an overwhelming sense of satisfaction. You think I’m yanking your chain? Give it a try and you’ll be hooked. Why I Like The Landmass Scratch Off World Map? And everyone knows bigger is better. But how big exactly? 24 inches wide and 17 inches tall (60cm x 43cm). This is big enough to see painstaking detail expert cartographers went through to create this masterpiece of line art. Landmass currently have the scratch off world map on sale for US$27.99. That’s less than a couple large pizzas. And a lot better for your waistline. This isn’t some gimmick that will fade after a few months. It’s printed on heavy glossy stock paper and will last for many years to come. Everything that glitters IS gold… at least in this case. And it gives the map an extra punch of panache. Scratch away the countries and flags to reveal bold, eye-catching colours. This isn’t a wallflower to hide in a corner. It demands centre stage and is ready to be seen. Just because you’re cool and travelled to Nevada (remember that Las Vegas long weekend? ), you still have 49 US states to reach. Feel the progress on the largest countries (by size) as you traverse them one state/province/territory at a time. Yep, every flag for every country. Well, all the important ones. And even the newest kid on the block is represented – South Sudan! A controversial, yet heartfelt, apology goes out to Taiwan (from me) which doesn’t get it’s own flag. Hopefully the Communist Party of China doesn’t read this blog. 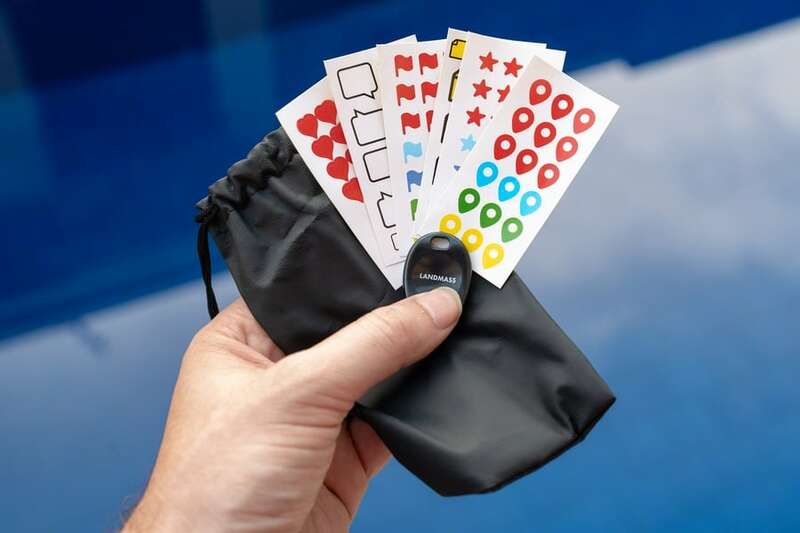 Let your creativity run wild with a bunch of colourful stickers to personalise your scratch map – map pins, love hearts, stars, flags and speech bubbles. Stickers always make everything better. Just like Michael Jackson. I personally like the black better – the map, that is. Landmass stand behind their scratch off world maps with a lifetime guarantee. If you don’t like it after a while, they’ll end your life. Nah, not really! They’ll make sure the map stands the test of time. Scratching the map is just scratching the surface. You’ll be surprised how versatile this scratch off world map can be. Spread the love all over the world - Landmass offer delivery worldwide. You’ll even get free shipping with every purchase of 2 maps (or more). The loved one in your life will be wrapped. And if they don’t like it, just remind them they can disappear too without a trace, just like Taiwan. Combine this strategy with a perfectly executed peacock walk for maximum effect. Be warned, they may try to gouge your eyes in a fit of jealousy if you show off too much. And then you won’t be able to see the beautiful colours of your map. Or perhaps they’ll just ask you to recount your stories from that epic backpacking trip to Nepal. Oh yeah, that’s what this map is for! It looks great in every living room, office, den, mancave, outhouse and jail cell. Good to know if the Communist Party of China catch up with me. I’m sure Napoleon Bonaparte or Genghis Khan would have hung one of these scratch maps in their home (or yurt) if they existed back then. Conquering would have been much, much easier! They’d be so peanut butter and jealous if they saw you now. Next time you see the Kazakhstan flag during the opening ceremony of the Olympic games, you won’t need to scrunch up your face and ask, “who’s that?”. Oh, your friends will be impressed! And if you don’t have any friends to watch the opening ceremony with, now’s a good time to start making new friends. Here’s a group of map lovers on Facebook to get you started. What about those obscure, little-known countries that no one talks about? Brush up on your geography skills and politics. Combine the scratch off world map with the Wikipedia mobile app, and you’ll be a geo-buff in no time at all. Shhh… don’t tell the youngsters it’s educational! Ok, you must love maps as much as I do. Or there’s nothing new to watch on Netflix. I know you’re going to say, “but Josh, how do I hang one of these on my wall?”, and I’m glad you asked. The clever folks at Landmass offer a matching magnetic hanger frame that is so easy to assemble, Blind Freddie could do it. That’s it. Now you’ve got no excuse. Go buy yourself a scratch off world map right now. If you don’t, you’ll make me look bad. And not in a Michael Jackson kind of way.